Classified advertising packages are offered in 3, 6 or 12 month contracts. Rate: $1 per word. 20 word minimum. No images. Must be prepaid in full via check or paid monthly by credit card only. Payment: After we review your submission, we will confirm the amount due. Please fill out the payment authorization form (PDF) and email it to publisher@nabuxmont.com. Payment is due no later than the 15th of the month prior to publication. Submissions will not be processed until payment is received. Classified advertising is one of the most common forms of advertising. It is economical, doesn’t require additional costs for layout and design and, for many businesses and/or individuals, a great way to put repetition to work by reaching our niche audience of health-conscious readers each month. This mode of promoting one’s product, service or practice can also be used in tandem with other classified listings under different categories as well as other methods of advertising and promotion in the same publication. Each of the different ads will have a uniquely different approach to draw attention from a particular type of reader, where another approach won’t have the attraction. 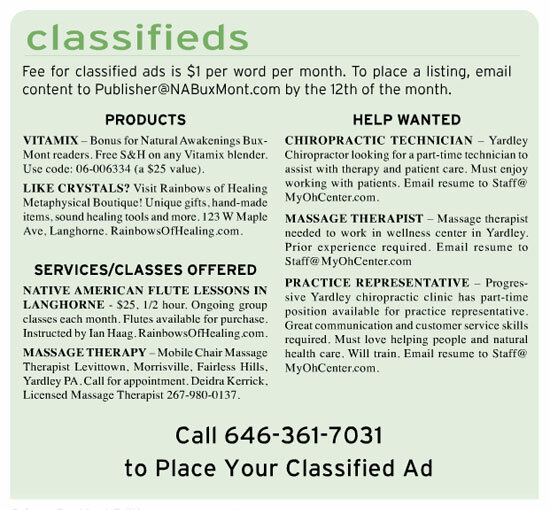 A well-designed classified ad, although lacking in the pizzazz and sizzle that can be created with display advertising, can be good for many types of products and services other than those typically placed in newspapers for used items, cars, household goods, etc. Like any advertising, a well designed approach for a product or service of value, reaching the right audience at the right time, can work. That’s where Natural Awakenings’ classifieds comes in. We have a wide distribution to a very specific audience. Use short, complete sentences that are easy to understand. Use action words that relate to the benefits of the product or service. Make it easy to understand what’s being advertised. Don’t make it hard to contact you! Get ideas from classifieds that have been (or seen) running for some time, whether in our publication or other, similar print media … they are probably working. Please carefully double-check your submission for accuracy. We are not responsible for incorrect information provided. Also make sure submission is not in all caps. Please turn off your CAPS LOCK. You will be asked to resubmit your listing if it appears in ALL CAPS. Any images submitted must be in png, jpg, gif or pdf forms. For optimal performance, please keep the file sizes less than 3MB. Make sure the name of the image doesn’t contain any “/” or “%20″. We do not notify in advance of publication or send proofs. If we have questions about your submission, we will contact you. Publication of Natural Awakenings Article is solely at the discretion of Natural Awakenings’ publishers and editors and subject to available space, guidelines and applicability to the theme of the magazine. We publish only those submissions that we feel are a good fit in our magazine and only those for which we have adequate space in the magazine. We may exclude any submission for any reason. Other submissions may be considered for the website. Contact us at (267) 544-9585 or Publisher@NABuxMont.com.